Adapter valve with conversion thread works on existing 3/8 compression or 1/2nps angle stop valve allowing access to water supply for reverse-osmosis systems, ice maker, automatic coffee equipment, etc. With capability to shut off water supply to dedicated line for easy filter replacements. The John Guest ASVPP5LF - 1/2" X 3/8" x 1/4" Angle Stop Adapter Valve (Lead Free) is constructed of white polypropylene with food grade 'O'-rings. 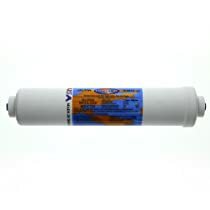 The John Guest ASVPP5LF connects between your valve and riser, to the main water supply line, for applications in Reverse Osmosis, Water Filtration Systems, Automatic Coffee Brewers, Ice-makers, and many more. The John Guest ASVPP5LF is not to be used with compressed air, explosive gases, petroleum spirits and other fuels, or for heating systems. I have both 1/2" and 3/8", and wasn't sure which one was which. Adapter made life easier. The 3/8" to 1/4" converter is really handy. A very well designed product especially for the under the sink filters that are connected to a separate filter faucet.